The online version of this article ( https://doi.org/10.1186/s12864-019-5642-0) contains supplementary material, which is available to authorized users. A complete and accurate genome assembly is a crucial starting point for studying the connection between genome function and organismal biology. 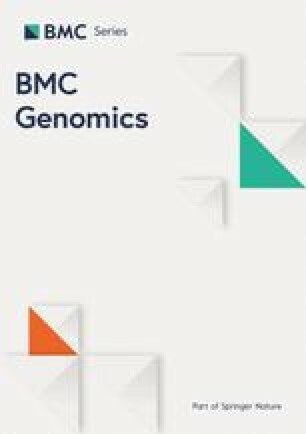 High quality genome assemblies are needed for reliable analyses of comparative genomics, functional genomics, and population genomics . High-throughput short-read sequencing technologies now allow the routine generation of massive amounts of sequence data for a fraction of previous costs . Despite this, however, these data are not amenable to producing highly contiguous de novo assembly and tend to result in highly fragmented assemblies due to the difficulty in assembling regions of repetitive DNA sequence . Many available genome assemblies, therefore, have low contiguity and are fragmented in repetitive regions . Chromosomal structures of fundamental importance to genome function such as centromeres and telomeres are also rich in repetitive DNA and often missing from genome assemblies, which hinders studies of their role in cell division and genome stability. Repetitive sequences are also often involved in generating structural variants, which are important for generating phenotypic variation, and are implicated in processes such as speciation, adaptation and disease [4, 5, 6, 7]. Several long-range sequencing and scaffolding technologies have been developed recently that can be used to produce de novo assemblies with hugely improved quality and contiguity . The chief advantage of these technologies lies in their ability to span low-complexity repetitive regions. Here we utilize four of these methods: PacBio, 10x Chromium, BioNano and Hi-C. Pacific Biosciences (PacBio) single-molecule real-time (SMRT) sequencing produces reads of tens of kilobases, enabling assembly of long contigs . The linked-read 10x Genomics Chromium technology uses microfluidics to localize multiple short reads to the same molecule, facilitating scaffolding of short reads . The BioNano optical mapping technology detects the occurrences of small DNA motifs on single molecules, which enables long-range scaffolding of assembled contigs [11, 12, 13]. The Hi-C method identifies chromosomal interactions using chromosome conformation capture that can be used to group and scaffold contigs using their physical proximity in the genome [14, 15]. Each of these technologies suffers from weaknesses and no single technology alone is likely to generate an optimal assembly. For instance, assembly of long reads is still problematic in long highly-repetitive regions and it is challenging to generate sufficient depth across most eukaryotic genomes to produce chromosome-length contigs using long-read sequencing due to the long length of some repetitive regions and the sequencing cost . Linked-read sequencing provides a significant improvement in contiguity over assemblies produced by short-read sequencing alone, but still suffers from the same drawbacks for assembling highly repetitive regions into complete contigs. Long-range scaffolding technologies such as BioNano are able to produce highly contiguous scaffolds, but it can be problematic to place short contigs on these scaffolds due to lack of homologous motifs . Due to these various drawbacks, the current state-of-the-art for genome assembly is to use a hybrid approach combining multiple technologies [18, 19, 20, 21]. 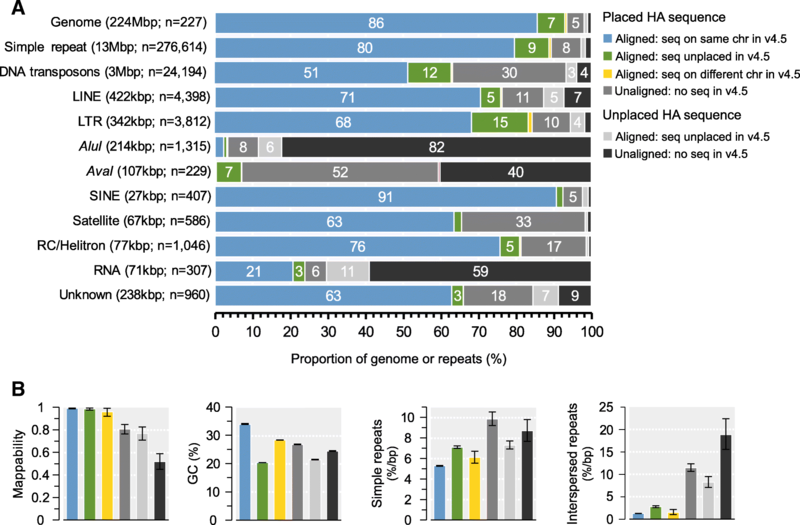 Several genome assemblies produced in this fashion are of comparable or better quality than finished human and model organisms that have undergone large number of improvements with additional data [1, 22, 23, 24, 25]. The western honeybee Apis mellifera is a species of huge importance to agriculture and ecology and a model for understanding the genetic basis of behavior and the evolution of sociality [26, 27, 28, 29]. With the use of chromosome banding techniques, telomere- or centromere-labeling fluorescent probes, and genetic maps, the honeybee karyotype was well-established decades ago [30, 31, 32, 33]. The honeybee genome is ~250Mbp and consists of one large metacentric chromosome with two long chromosome arms (chr. 1) and 15 smaller submetacentric/acrocentric chromosomes (chr. 2–16) , in which the centromere is located off-center and delineates a short and a long arm. The first published genome assembly (Amel_4.0), based on whole-genome shotgun sequencing with Sanger technology , suffered from poor coverage of low-GC regions and recovered unexpectedly few genes. 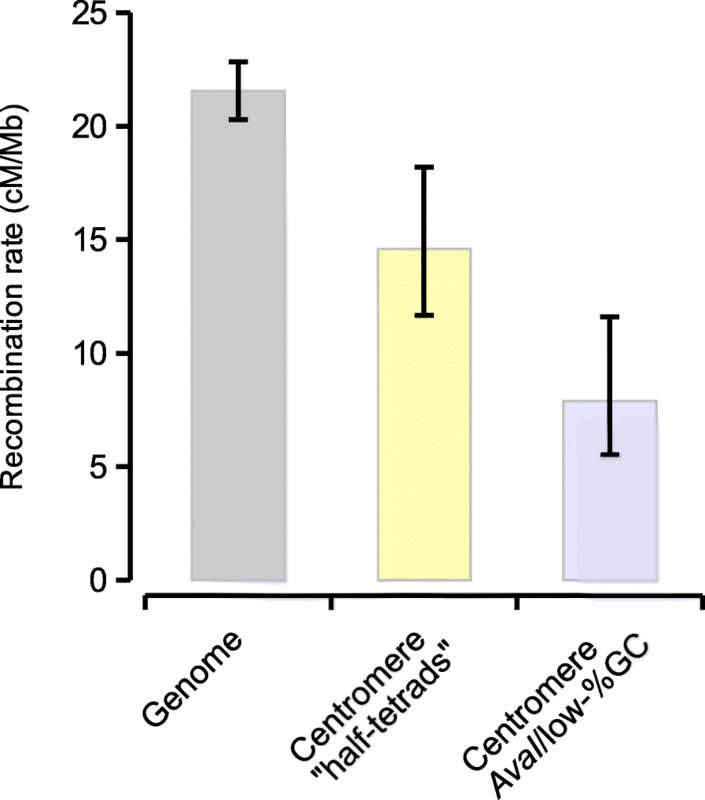 An upgrade incorporating next-generation ABI SOLiD and Roche 454 sequencing of DNA and RNA (Amel_4.5), improved sequence and gene coverage , but the assembly was still fragmented (N50 = 0.046 Mbp) and large-scale features and repeats such as centromeres and telomeres were still largely missing or poorly assembled. An improved genome assembly is therefore of great utility for uncovering the function of genes and other chromosomal features. Honeybee telomeres have two different structures. 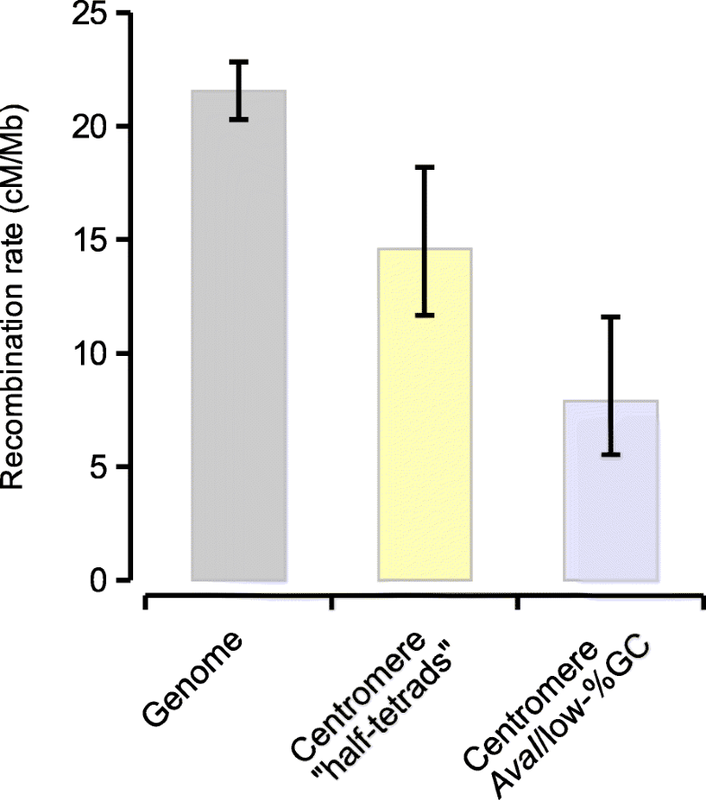 Short-arm telomeres (which are close, or proximal, to the centromeres) consist of tandem arrays of the 176 bp AluI element that make up as much as 2% of the genome (~ 2000 repeats or 350kbp per telomere), as estimated with restriction enzymes and fluorescent probes [30, 43]. 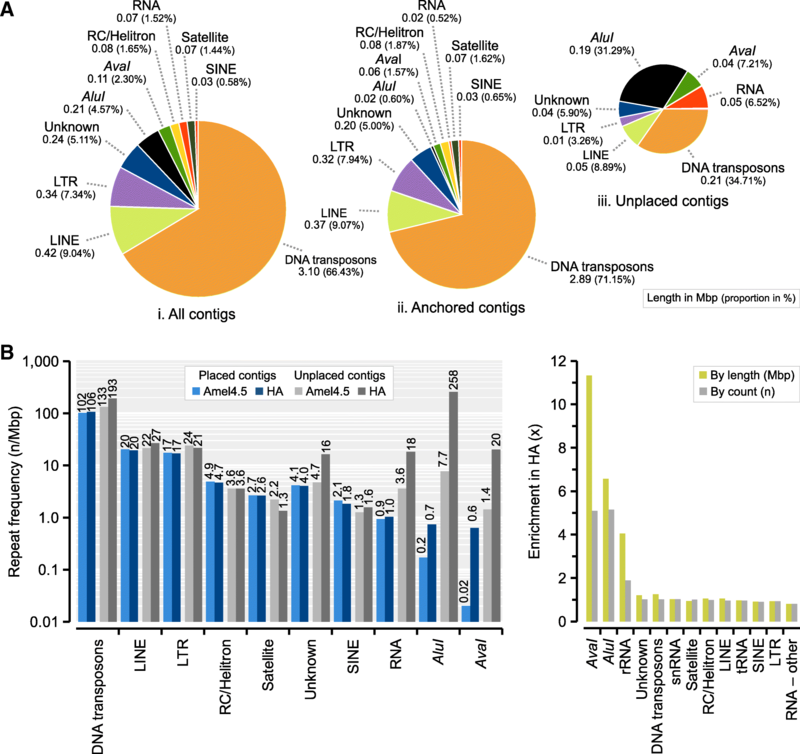 Telomeres on the long arms of chromosomes (distal to centromeres) have shared subtelomeric blocks that are followed by extended iterations of the TTAGG repeat and were originally characterized along with the first published honeybee assembly [33, 45]. 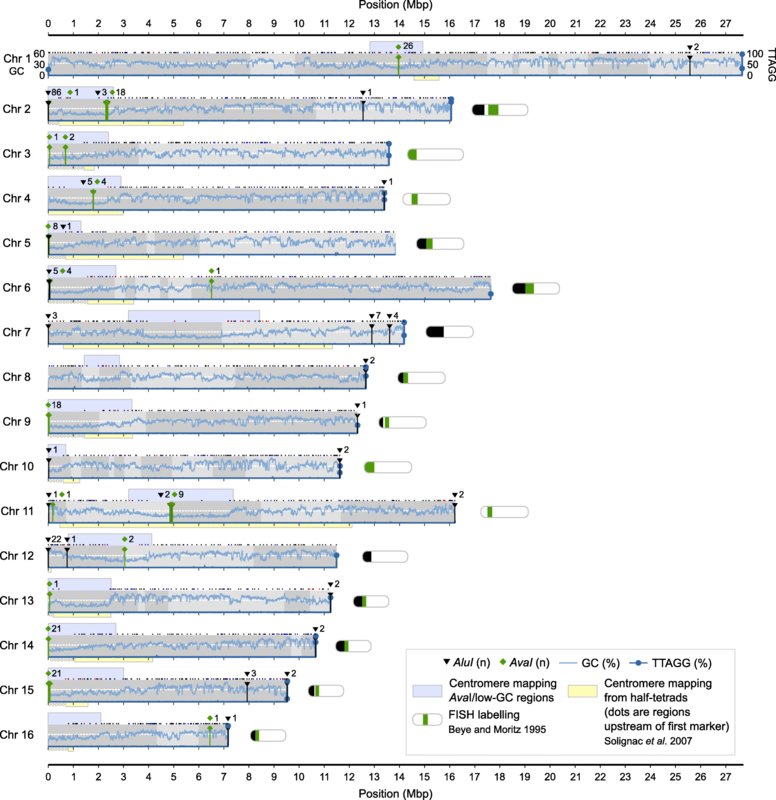 The TTAGG repeat is likely ancestral for insect telomeres [54, 55, 56] and has been estimated to range between 2 and 48 kbp in size among chromosomes using Southern hybridization . The difference between proximal and distal telomeres has been hypothesized to support chromosome polarity and pairing during cell division .